Full surface adhesion to the substrate offers a time-saving installation. 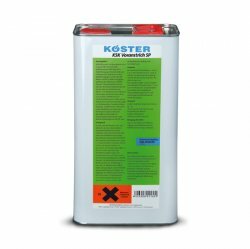 The KÖSTER TPO Membrane features a special fleece coating which increases the bonding of the KÖSTER Polyurethane membrane adhesive. This results in a high adhesive strength and creates a perfect bond to the substrate. It is important that the substrate is suitable for a good adhesive bond. If necessary, an adhesive bridge can be applied. In addition, a wind load calculation must be carried out prior to the adhesion of the membrane in order to provide information about the amount of adhesive required and the alignment of the welding seams. The KÖSTER Polyurethane membrane adhesive is applied in strips to the substrate, the fleececoated KÖSTER TPO Membrane is unrolled, and the membrane is firmly pressed onto the substrate using a rubber hand roller. This enables the adhesive to be spread evenly and help achieve uniformity of the bond. When distributing the adhesive care must be taken to ensure that no material is applied to an area that is to be welded to another sheet.